Glenn Lyons is quoted in the Juice article: "It has to be urban. It has to be sophisticated, but it has to be cool - cool in a gritty way." What we will find is that "cool" and "gritty" cannot be manufactured - they have a limited shelf life, particularly when they come from above as part of an organized strategy. Once the newness has worn off, cool places become just places. If the intention is placed on making cool places instead of good places then long-term failure is assured. Yet good places can also be cool places. 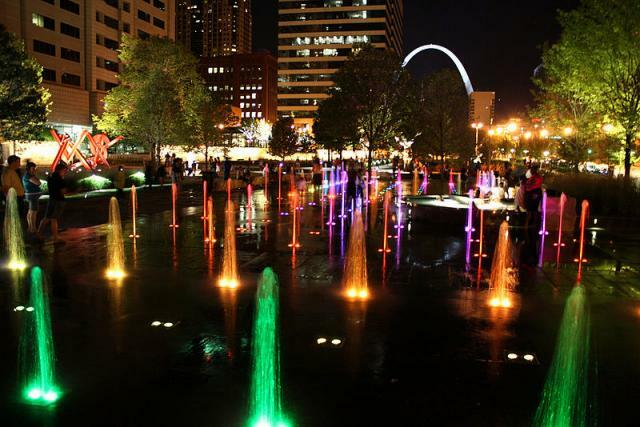 Take a look at Citygarden (below) in downtown St. Louis. It is both a good place and a cool place. It has art and water and light. It has open, multi-use space, small spaces, big spaces. It hosts restaurants and pedestrian retail around the edges. One does not just plan a "gritty" place. Gritty places emerge organically. Gritty is not what we want for downtown - rather we should aspire to create spaces that pedestrians want to be - old and young, parents and YPs, active and passive, wealthy and poor. This is how sustainable development is done. In the Juice article, City Planning Administrator Michael Ludwig compares the distance along Walnut Street to the National Mall in DC - a distance people are willing to walk when there are things to do and see along the way. He is right... and a bit wrong. The National Mall is at its core a public place. The points of interest that inspire people to walk a whole two miles are museums, memorials, historic spaces. The walk between the Lincoln Memorial and the Capitol succeeds because it is a nice walk with things to look at and do along the way (I've done it). A lot of the walk, however, is unplanned space. It's not gritty. It's filled with "art" - but good art, not cool art. But there is not a whole lot of pedestrian retail. It is a completely different strategy to create a vibrant and energetic pedestrian retail district. I have said, and still say that the skywalks are a major deterrent to development of pedestrian retail and entertainment district streetscapes such as proposed on Walnut. Indeed, the actual design and intent of skywalks is to remove people from the street - to "mall" (maul?) 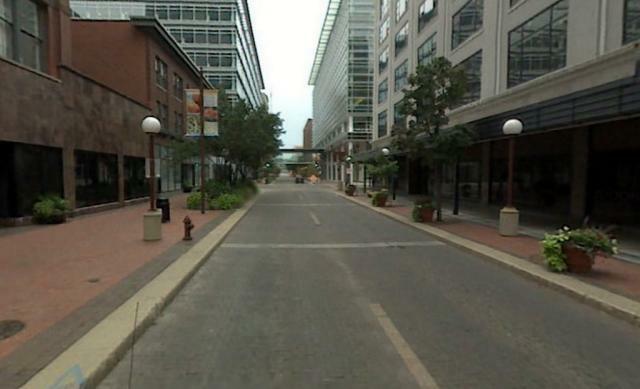 the downtown, privatize pedestrian movement, and deter street-level activity. Any comprehensive look at encouraging sustainable street-level development downtown has to look at removing the skywalks. Yes, skywalks kill pedestrian activity.